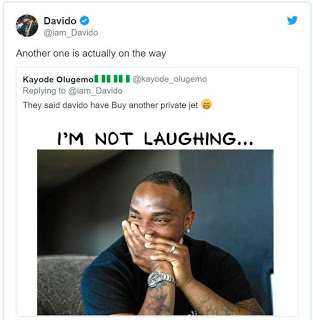 Shey Davido is Joking ni!!! He just announced that he is getting another private jet. The Assurance and One ticket coroner via his Twitter handle confirmed the arrival of his new personal private jet. Fans were shocked by this revelation. Although the OBO Prince had earlier in a previous statement revealed that the current 'PJ' was for his Dad. "People are already rumouring that he has bought another private jet". Is Davido trying to leave Chioma with this one ticket?